While on a walk through the forest, I kept smelling garlic but could not place it exactly in my mind. It was not something I was expecting. "I smell something good, like an herb", I said to Brigitte. "Smells like a shish kebab roasting over a wood fire" she said. We laughed and took one anothers' arms and walked ahead of the men. After a while, the source of our amusement became clear and something different altogether. We were standing in a patch of ramsons in bloom. 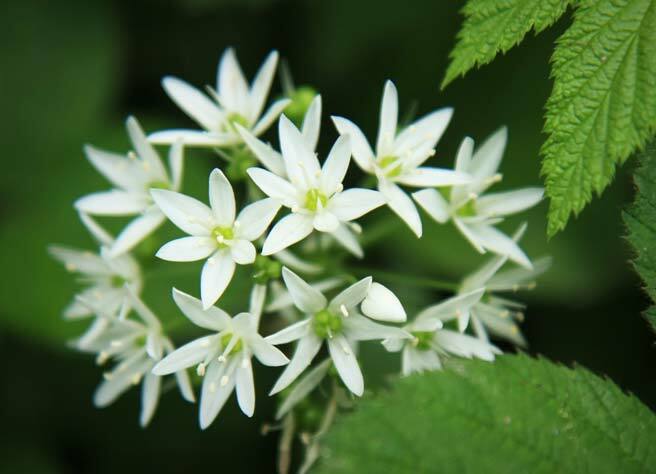 Ramsons are a European cousin to the ramp, a wild garlicky chive, called ail des ours in French because bears will dig up the ground to get to the roots. I wasn't aware of it at the time, but a little research upon return to the grid tells me wild boars also go crazy over ramsons. With the way they have been completely destroying the field behind the house in the mountains, I think now that maybe I shouldn't have transplanted a few of these into my shade garden. We've seen the boars' damage over the last few months. Thankfully it stops at the electric fence put up by a farmer in the village. It wasn't until last week, now that sunset isn't until well after 9 pm, that I saw the whole clan. I will describe the 10 second encounter as briefly as I can. I was in the garden at dusk, giving a few last admiring glances to the pampered residents of our potager, now at home in their beds, beginning to spread their wings. I clipped a bunch of herbs and headed back in. I heard some grunting but thought it was the Tarine cows that have been set regularly in the pasture these past few weeks. They call to one another at the end of the day. There was a bit more grunting than usual, and it was bordering on a kind of growling, but I didn't pay it much mind. There are some young males in the herd that have begun to act up. So I went to the kitchen to continue my preparations for dinner, to stoke the fire in Bernadette, washing what I'd picked in the garden. Loic took his turn outside and while he was out waging war on slugs, I heard a particular sound that resembled an enormous cow loudly belching, and looked out to the field through the window of the kitchen door. There, centered perfectly in the frame of the door at some distance, stood a magnificent specimen, jet black, silhouetted with a golden hue from the last vestiges of the setting sun. Large forward set ears perked high, she must have been about the size of one of these young cows, but with the classic beautiful heft that we know to be the wild boar. The light was magical, and my camera was just there, not far. I tried to move slowly and opened the door to compose my shot. She stood perfectly still, looking in my direction and suddenly let out a startling cross between a scream and a groan a nanosecond before bolting in the direction for the woods. At that moment I realized that there were two others, big fat teens about half her size but still fully grown, who had responded to the call and were galloping fast, their fat rumps jiggling, straight for cover. Gone. I was reeling in the moment of having finally seen these creatures. I started to leave the house to ask Loic if he had seen them, and then I saw, on the hill from the woods, the big one galloping fast again back towards the house. There is a good distance between the kitchen door and the copse of trees where they sought cover, but I wondered why she was running with such purpose, and stepped back into the kitchen, ready to slam the door if necessary. In quick movements, she performed what I can only describe as a 3 point turn in less than a second, gesturing with her entire body. It was almost human, like a toss of the head followed by a nimble, almost impossible turn for her sheer heft that said "this way!" Then, from under an apple tree quite close to the kitchen indeed, trotted seven sangliettes, in pairs at first and then a group of three, the size of large tom cats, all fawn colored and striped down their backs, flipping their tails and briskly trotting in single file to follow their mother back into the woods. We only gathered a little of this wild garlic because I assumed the bounty was never ending from the heady scent we bathed in while we walked arm and arm in the woods. I'd said, "Come on, let's get it from the next patch. ", only there wasn't a next patch. By the time we realized it, we were too far into our forest loop to turn back and still have time to get the fire started for dinner. Flowers, stem and root are all edible and delicious, you can use it all. Since we had only collected a little bit, I carefully washed them while admiring the details of this plant. In retrospect, I valued its scarcity that night, it took on a special value in my mind, like a rare specimen. When you only have a little, your only solution is to be the minimalist and use it in as simple a way as possible. No real advice at my disposal, I followed my instinct, and sliced what we had on the diagonal and put it on the hothouse tomato halves they'd brought from down south, with some coarse sea salt. I wrapped each half in double foil to make sure the herb stayed moist and not too hot, to very lightly steam and soften at the edge of the hickory fire while the cote du boeuf roasted that evening in the garden. I kept reminding my guests to keep their eyes peeled for the sangliers, which I have not seen since our encounter. Add this to my list of foraged herbs in my mountain notebook. It was delicious. We did not need a bushel of ramsons, just a few. Best left in the wild, I think. I know where the patch is. I felt like I was there with you! I am very fond of porcine creatures. 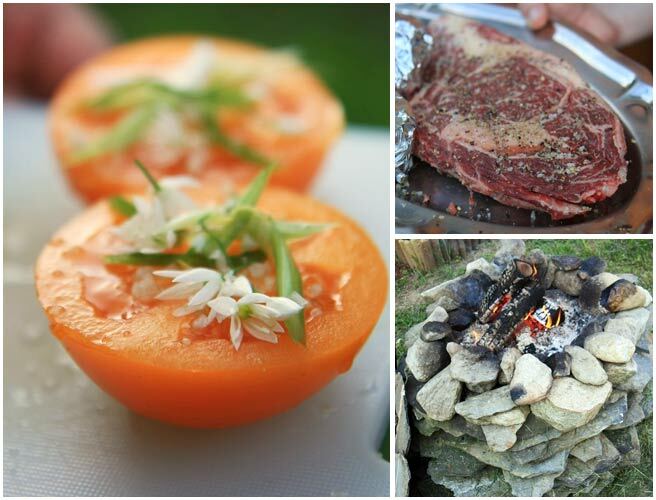 I will try some tomatoes on my grill like you mention, though I will use chive flowers from my garden in place of the ramsons. Thank you for a wonderful description! Still as beautiful as ever Lucy. Was it a bear or a boar? I'm guessing the latter. I've been a few times to San Gimignano and only seen boar sausage. You are indeed privledged. I will be in Lyon the 19th for a macaron lecon at Bouillet and to see the BEN exhibit!! Can't wait to see BEN enfin. Just recently found your lovely blog...we gorge ourselves on ramps, with their rosy stalks, in Spring in New York but never see them offered in the flowering stage. Love the notion of roasting it all over the same fire-can almost smell it now! Thanks for your nice comments! It was a whole lot of boars. I was wondering if we should call some sort of animal control since they've really gotten prolific. I don't know where to start though. Beautiful story, and lovely photos... I can almost smell the wild garlic.